People tend to associate the term ‘lead guitar’ with a howling solo by Jimi Hendrix, or Van Halen, or Slash from Guns ’n’ Roses. 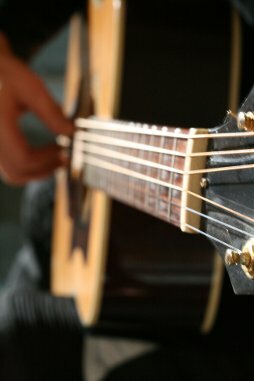 On the Introduction to Lead Guitar course we will look at playing solos, of course, but that doesn’t happen so often in the worship context – It’s often more a matter of finding something that compliments the song and adds to what the rhythm player (who’s probably playing the open chords) is doing, but without getting in their way. We’ll do some work on scales, playing in different positions on the neck, left hand techniques (sting bending, etc), right hand techniques, guide tone lines, partial chords, blues form and scale, and possibly look at effects for the electric guitar too. And we’ll examine these in the context of playing on actual songs. Pentatonic scale forms for the CAGED chord shapes are shown along with Pentatonic exercises. The course is designed to get students started on single-string, lead guitar techniques to enable them to jam with another musician or in a band context.